OK. I'll be the first to admit that I'm not much of a connoisseur when it comes to the different sounds of stereos and speakers. But my day job is as a classical musician, so music is certainly important to me. As you can see here, our current set up is less than perfect - a vintage amp (that has some issues), a Sony turntable and a Discman. Yes, a Discman. Tragic but true. This one's been around for ages, but I think it's a design classic. I'd love it wall mounted. "Insert a tape into the tape deck, then switch the stereo to "Tape." Press "Play" and the audio from the tape is put into the stereo system, playing through the connected speakers." Awesome. There are also instructions on how to use a CD player. Such coolness. 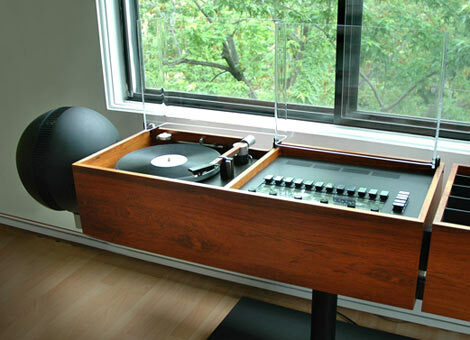 I think I need this Clairtone. And now I'd like to add some beauty to your day. Here are a few of my favourite pieces of music. I hope you enjoy them. This song is "An die Musik" by Schubert. The rough translation is "To Music" and is basically an ode to how music is a constant companion through life. And here is a piece for my instrument, the viola. I love the passion and longing in this piece. This is a cool music video from I Furiosi, which is a group in Toronto who pushes the boundaries of 'typical' classical performance stereotypes. Check it out!